Norwich: M. B. Young, Print, 1841. 1st printing. Now housed in an archival mylar sleeve. Age-toning. Tack holes at the corners. Faint fold lines. Very Good.. 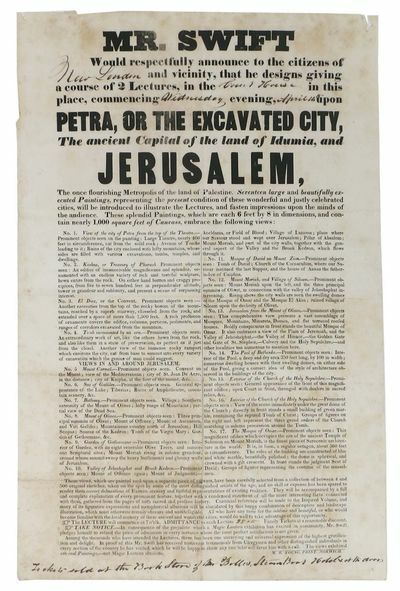 Broadside, 13 lines of introductory text at top, over 2 columns of text describing the paintings to be exhibited. A job printing announcement, with the city, lecture location therein, day of week, and date all in manuscript at top. Price of the lecture [25 cts] in mss in the 7th line from the bottom. In the lower margin has been inked, "Tickets sold at the Book Store of Mr Bolles, Steam Boat Hotel & at the doors". 18" x 12"